Bill Bradley came home last week. The Missouri native announced his candidacy for president in Crystal City, Mo., south of St. Louis, and took a bus trip along the Mississippi River to Keokuk, Ia., before heading to Des Moines. Bradley, known best as a Rhodes Scholar, a basketball star with the New York Knicks and a former new Jersey Senator, has a reputation for being stiff and aloof. 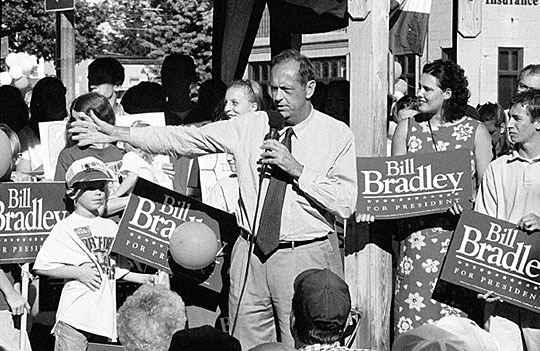 That wasn't the Bill Bradley who spoke to several hundred Iowa supporters, the press and some hometown friends he brought with to a small downtown Keokuk park. Bradley was relaxed and folksy, more Missouri than New Jersey. With an easy-to-sell philosophy like that, his unabashed optimism, and the massive financial support he's received from sports and entertainment figures, Bradley might be a tougher opponent than Al Gore anticipates.